Showing items in category Natal, sorted by newest listed first. NATAL - 1897 6 1/2d rate registered cover to USA. 1897 (SP.3.) use of longer envelope folded to size) registered to USA and bearing 1/2d and 6d adhesives tied REGISTERED DURBAN/NATAL. NATAL - 1911 2 1/2d rate cover to USA used at ESPERANZA in 'violet' ink. 1911 (AU.19.) 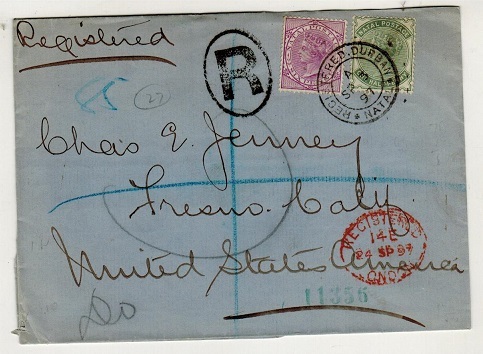 cover addressed to USA bearing 1/2d and 1d pair tied by ESPERANZA/NATAL cds struck in 'violet' ink. 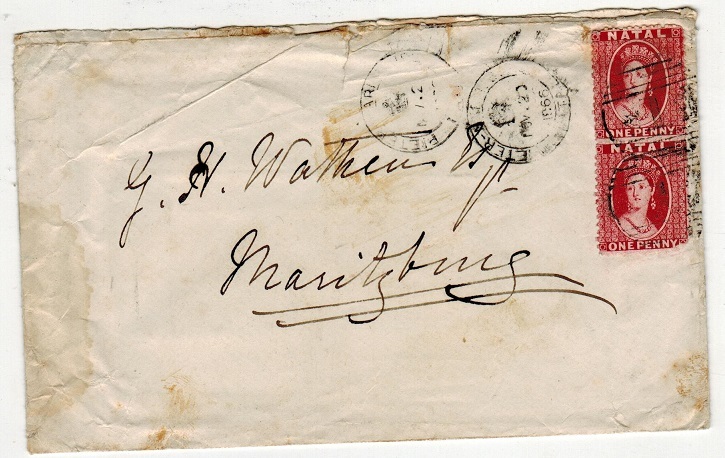 NATAL - 1866 2d rate local cover used at PIETERMARITZBURG. 1866 (NOV.22.) 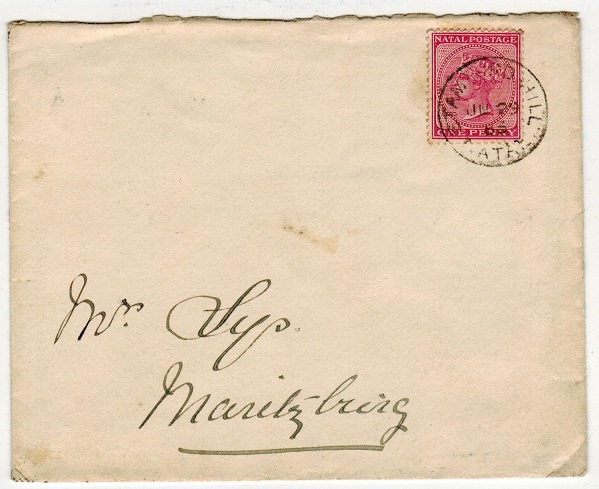 cover addressed locally to Maritzburg bearing a vertical pair of the 1d bright red 'chalon head' adhesive (SG 22) tied by '1' duplex's with crowned d/r PIETERMARITZBURG proving cds at left. A little crumpled at left and with some light glue type markings on reverse. NATAL - 1886 5/- (x2) and £1 (x3) REVENUES on piece used at MAGISTRATES OFFICE/DURBAN. 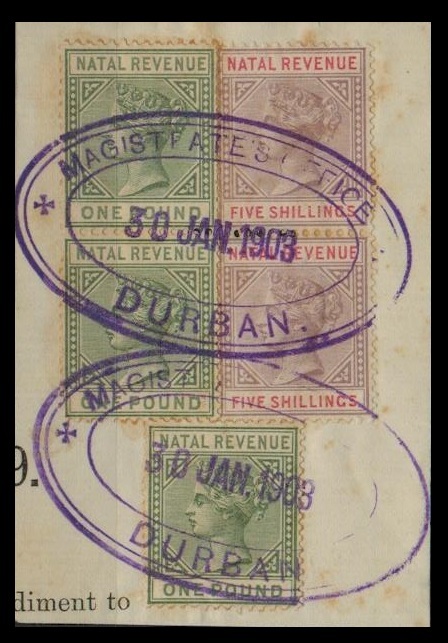 1886 5/- lilac and red (x2) and £1 green (x3) NATAL REVENUE issues tied to piece by violet oval MAGISTRATES OFFICE/DURBAN cds's dated 30.JAN.1903. Noted by SG in the footnote but no longer listed. NATAL - 1911 'Inter-Provincial' use of Transvaal 1d on local cover to Pretoria used at ROSETTA. 1911 (JA.13.) 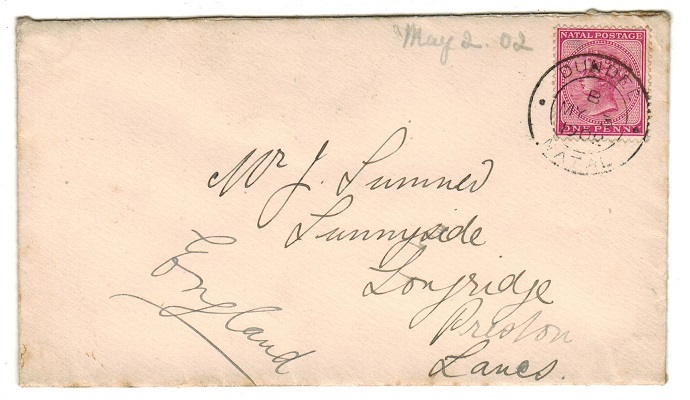 cover addressed to Lady Methuens at 'H.Q.H.' in the Roberts Heights of Pretoria bearing Transvaal 1d (SG 274) tied ROSETTA/NATAL. 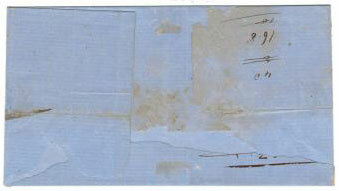 NATAL - 1912 'Inter-Provincial' use of Transvaal adhesive on registered cover to USA at IXOPO. 1912 (MR.29.) 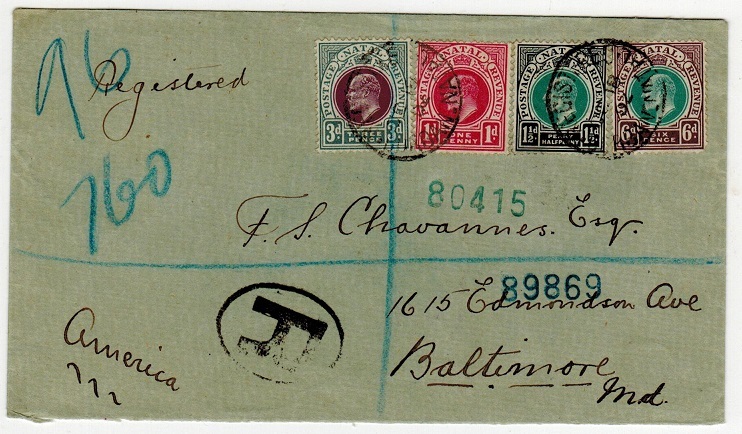 registered cover addressed to USA bearing Transvaal 1d, 2d and 6d adhesives tied IXOPO/NATAL. A scarce Inter-Provincial use. 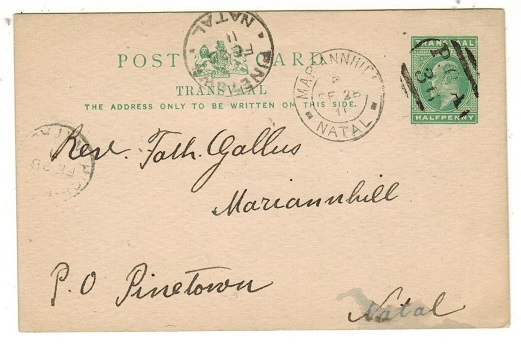 NATAL - 1911 use of 1/2d green PSC of Transvaal (H&G 11) tied P.O.A.36' with MARIANNHILL at left. 1911 (FE.25.) 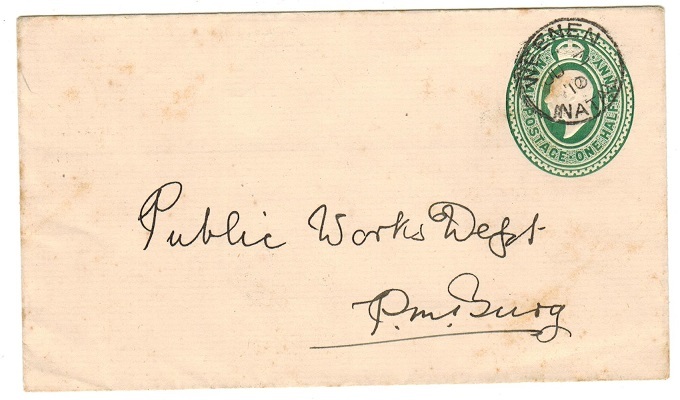 use of 1/2d green postal stationery postcard of Transvaal (H&G 11) cancelled by 'P.O.A. 36' with MARIANNHILL strike alongside and PINETOWN/NATAL arrival cds. Inter-Provincial usage. 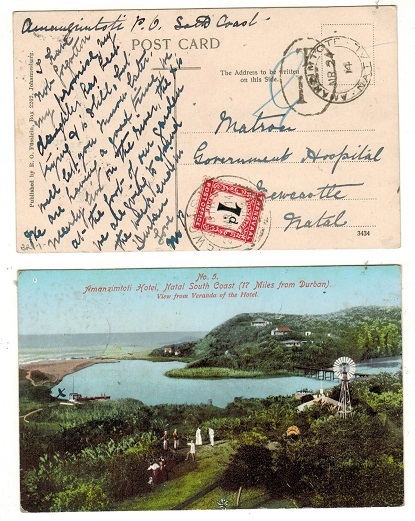 NATAL - 1914 local unpaid postcard from AMANZIMTOTI with Transvaal 1d 'Postage Due' added. 1914 (MR.24.) unpaid picture postcard to the Government Hospital at Newcastle cancelled AMANZIMTOTI/NATAL with oval 'T/1d' tax mark applied and having Transvaal 1d 'Postage Due' applied on arrival cancelled NEWCASTLE. A scarce use of this Transvaal postage due in the Natal. NATAL - 1906 1d rate postcard use to UK used at HATTINGSPRUIT. 1906 (NO.21.) 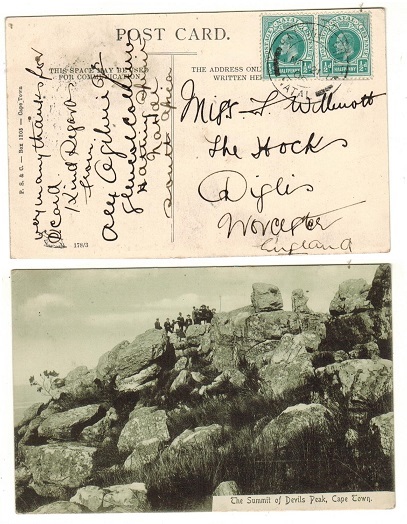 use of picture postcard addressed to UK depicting 'The Summit Of Devil Peak- Cape Town' bearing 1/2d pair tied by scarce HATTINGSPRUIT/NATAL cds. 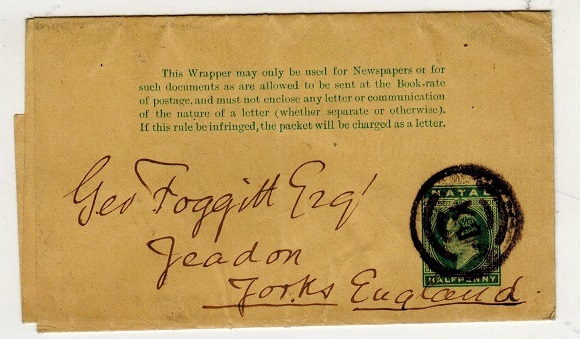 NATAL - 1901 1d rate 'Soldiers Letter' to Cape used at ACTON HOMES with PASSED/P.E./CENSOR h/s. 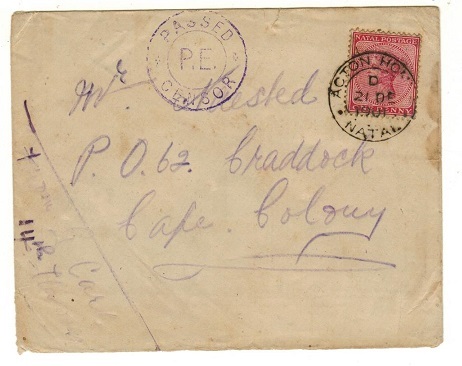 1901 (DE.21) cover to 'P.O.62' in Craddock in the Cape endorsed from 'G.Carl/14th Hassars' bearing 'QV' 1d adhesive tied by ACTON HOMES/NATAL cds & with violet two ringed PASSED/P.E./CENSOR h/s at left. A nice 'Soldiers Letter' used during the Boer War. NATAL - 1891 1d+1d carmine PSRC unused at handstamped SPECIMEN. H&G 6. 1891-93 1d+1d carmine on buff postal stationery reply type postcard showing 'Natal' below crown (size b) in unused condition and handstamped SPECIMEN in violet. H&G 6. NATAL - 1885 1d carmine postal stationery wrapper uprated to Germany used at WARTBURG. H&G 2. 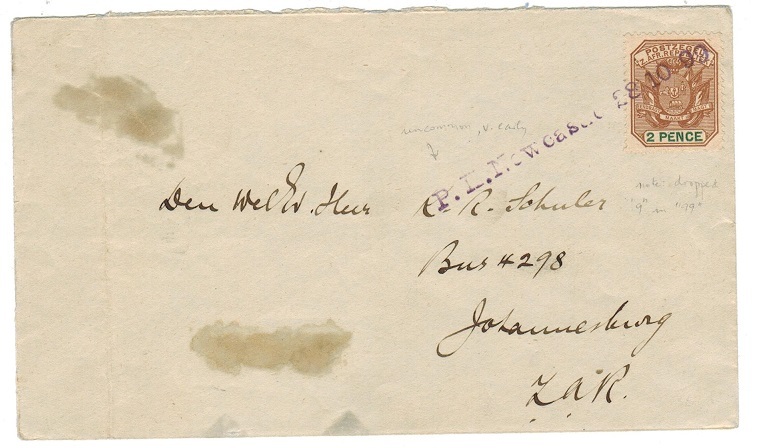 1885 1d carmine on buff postal stationery wrapper addressed to Germany bearing additional 1d adhesive tied by WARTBURG/NATAL cds dated JU.17.1899. H&G 2. NATAL - 1883 1d rate local cover used at STAMFORD HILL. 1883 (JU.29.) cover addressed locally to Maritburg bearing 1d adhesive tied by STAMFORD HILL/NATAL cds. NATAL - 1909 1/2d rate local postcard used at CURRYS POST/NATAL. 1909 (FE.22.) 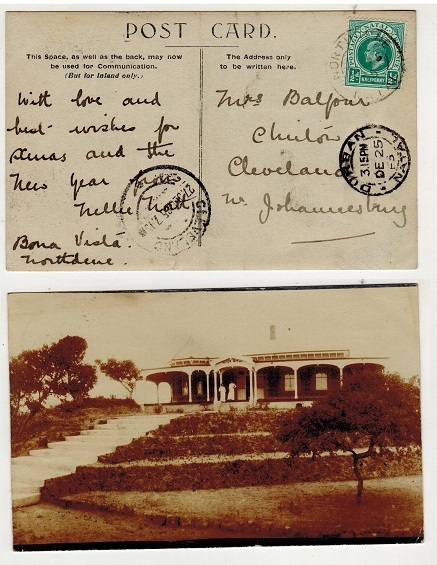 use of picture postcard addressed locally (some very light tone marks) depicting 'The Court House-Eshowe' bearing 1/2d adhesive tied by s/r CURRYS POST/NATAL cds. NATAL - 1902 1/2d PSC of Transvaal used at DURBAN/NATAL. H&G 11. 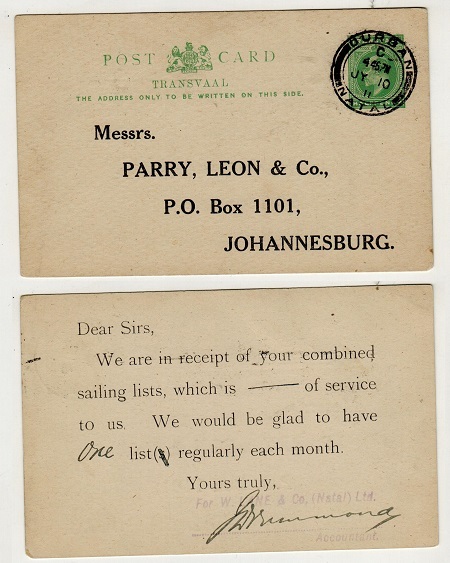 1902 1/2d green on cream postal stationery postcard of Transvaal (H&G 11) with pre-printed address for 'Parry Leon & Co' with pre-printed reverse for 'receipt of sailing lists' addressed to Johannesburg and cancelled by DURBAN/NATAL cds dated JY.10.11. An Inter-Provincial use. NATAL - 1893 1d carmine PSC to Tanga cancelled 'P.O.A.3' at P.O.Sunkelsdrift. H&G 7. 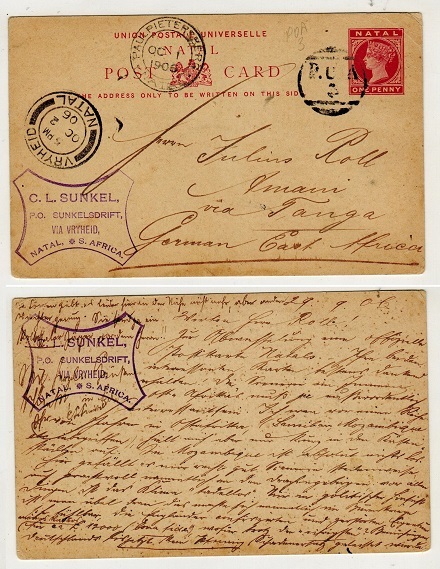 1893 1d carmine on buff postal stationery postcard addressed to Tanga in the German East Africa cancelled by 'P.O.A.3' strike applied at P.O.Sunkelsdrift. PAUL PIETERSBERG and VRYHEID transit cds's. H&G 7. NATAL - 1902 1d carmine PSC to Germany cancelled 'P.O.A.3' at P.O.Sunkelsdrift. H&G 11. 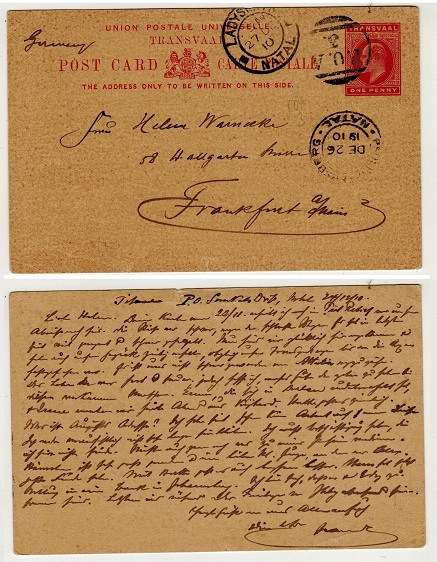 1902 1d carmine on buff postal stationery postcard addressed to Germany struck by 'P.O.A.3' strike of P.O.Sunkelsdrift. PAUL PIETERSBERG and LADYSMITH transit cds's at left. H&G 11. NATAL - 1859 1d FOURNIER PROOF struck FAUX in black. 1859 1d (SG type 6) 'Fournier' PROOF forgery printed in red on cream paper and handstamped FAUX. NATAL - 1902 6d deep violet REVENUE mint. 1902 6d deep violet and purle REVENUE/REVENUE adhesive in fine mint condition on multiple crown 'CA' watermark paper. 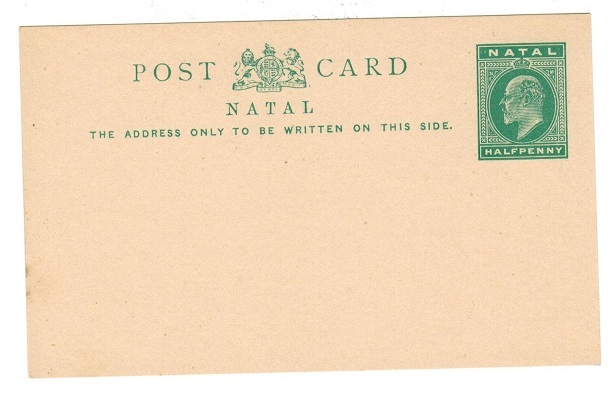 NATAL - 1902 1/2d green postal wrapper use to UK struck by 'DN' (Durban) parcel strike. H&G 3. 1902 1/2d green on buff postal stationery wrapper addressed to UK cancelled by scarce 'DN' parcel cancel (Hart type P2) used at Durban. The 'N' with defective right leg. H&G 3. NATAL - 1910 1d rate postcard use to UK from DURBAN struck 'POSTED LATE'. 1910 (OC.16.) 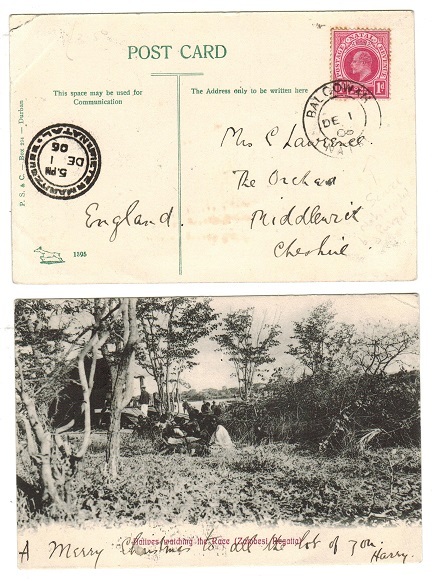 use of picture postcard addressed to UK bearing 1d adhesive tied DURBAN/NATAL and struck at left by scarce POSTED LATE handstamp. NATAL - 1902 1d carmine PSE to Germany used at DUMISA. H&G 4. 1902 1d carmine on thick cream laid paper postal stationery envelope addressed to Germany cancelled by DUMISA/NATAL cds dated JU.11.10 with violet boxed FRIEDENAU/DUMISA P.O./NATAL b/s. H&G 4. 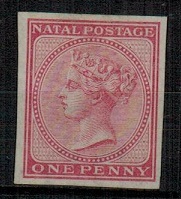 NATAL - 1901 1d carmine PSE used locally at ENNERSDALE and struck in 'violet' ink. H&G 2. 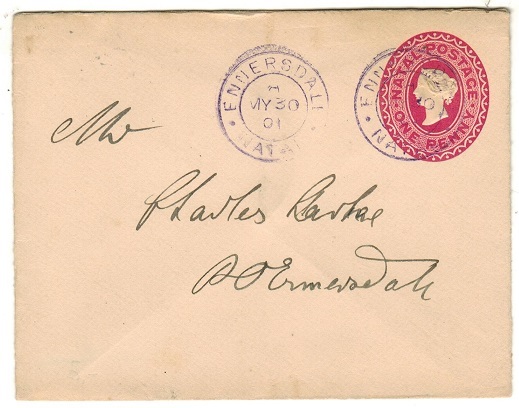 1901 1d carmine on thick cream laid paper postal stationery envelope addressed locally (light overall toned reverse) cancelled by ENNERSDALE/NATAL cds struck in violet ink dated MY.30.01. H&G 2. 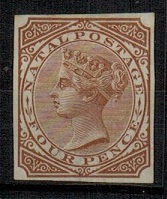 NATAL - 1885 1/2d brown PSC addressed to Pretoria with HALF on 1d surcharge adhesive added. 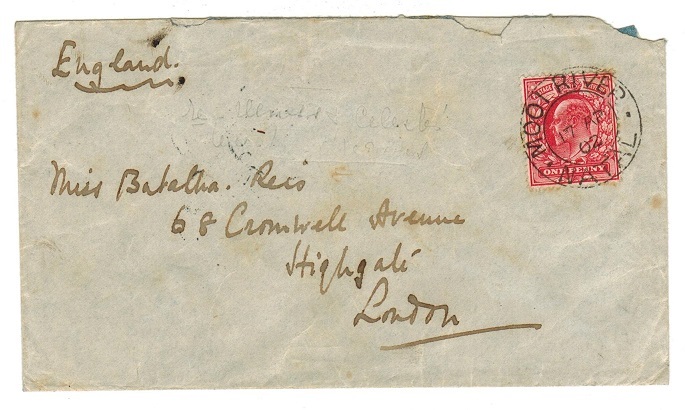 1885 1/2d red-brown on buff postal stationery postcard addressed to Pretoria bearing a copy of the 1895 'Half' on 1d rose locally surcharged adhesive (SG 125) tied by CHARLESTON/NATAL cds dated JU.5.95. A nice use of this stamp within period. H&G 1. 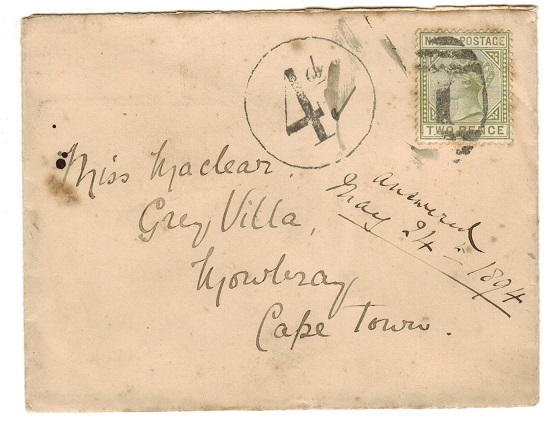 NATAL - 1894 underpaid cover to Cape Town with '4d' tax mark. 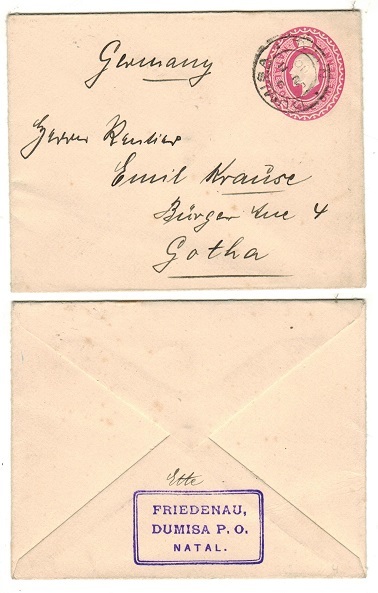 1894 cover addressed to Cape Town bearing 2d adhesive tied by '1' duplex with GPO/NATAL b/s dated AP.25.94 and with MOWBRAY arrival alongside. 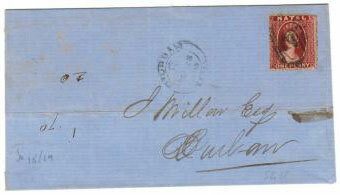 The cover was underpaid and is struck on the front by scarce circular '4d' tax mark. 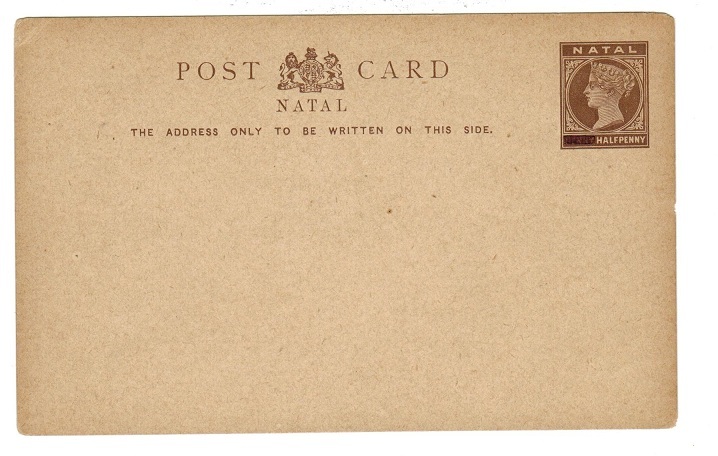 NATAL - 1900 'Army Form C.398' envelope to UK with 1d tied FIELD POST OFFICE. 1900 (FE.11.) use of 'Army Form C.398' envelope addressed to UK bearing Natal 1d adhesive tied by FIELD POST OFFICE/BRITISH ARMY'S AFRICA cds. Used during the Boer War. NATAL - 1905 1/2d rate Christmas Day use of postcard used at NORTH DENE. 1905 (DE.25) use of picture postcard to Johannesburg depicting a real photo of a house & bearing Natal 1/2d adhesive tied NORTH DENE/NATAL with Durban transit & Cleveland arrival cds's. Scarcer use on Christmas Day! 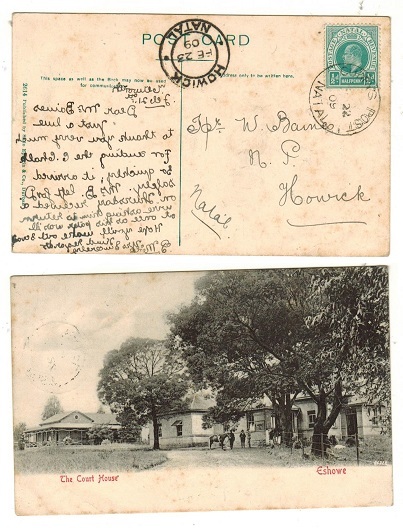 NATAL - 1904 1/2d rate postcard use to Potchefstroom used at WASHBANK. 1904 (DE.2.) 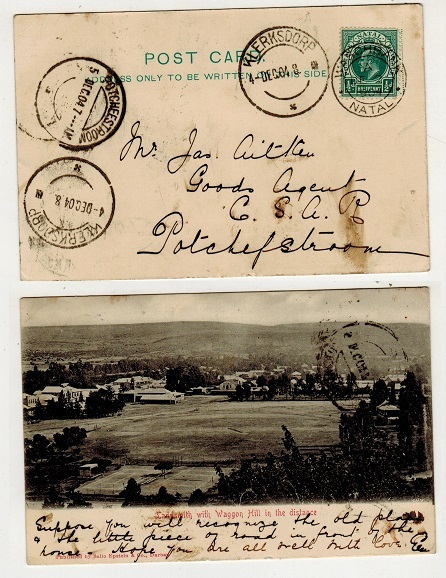 use of picture postcard addressed to Potchefstroom depicting 'Ladysmith with Wagon Hill in the distance' bearing 1/2d adhesive tied by WASCHBANK/NATAL cds. 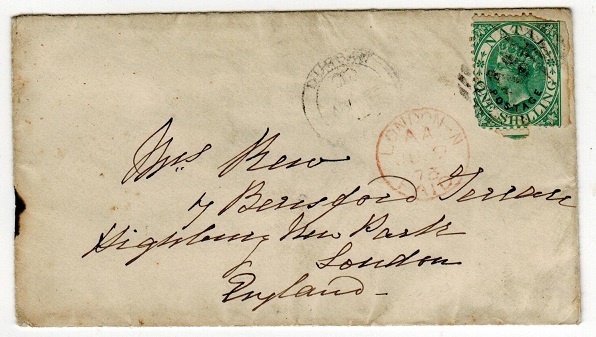 NATAL - 1873 1/- rate cover addressed to UK used at DURBAN. 1873 (MA.25.) 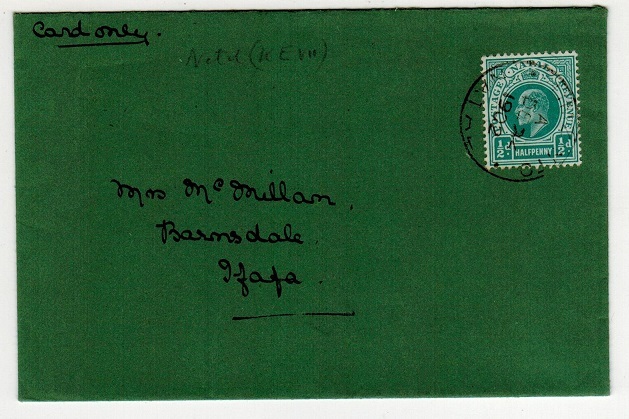 cover addressed to UK bearing 1/- green overprinted POSTAGE in green (SG 59-corner fault) tied by barred '2' h/s with weak DURBAN cds alongside. Red LONDON/PAID arrival below. 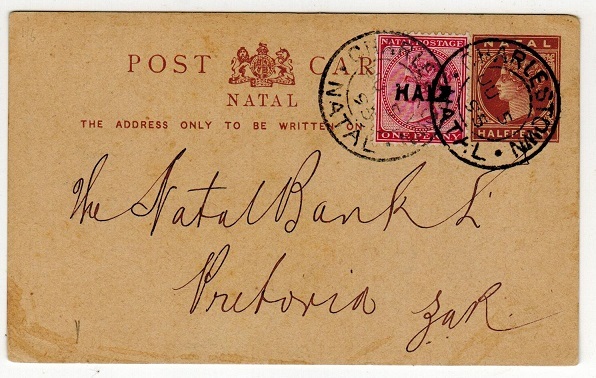 NATAL - 1874 6d rate cover to Port Elizabeth cancelled by '1' duplex of Pietermaritzburg. 1874 (10.6) cover to Port Elizabeth bearing 6d mauve (SG 62) adhesive (blunt corner) tied by '1' duplex cancel with G.P.O./NATAL cds alongside. PORT ELIZABETH arrival b/s. NATAL - 1874 1d IMPERFORATE PLATE PROOF in dull rose. 1874-99 1d IMPERFORATE PLATE PROOF (SG type 12) printed in the issued colour of dull rose on ungummed "CC" watermarked paper. NATAL - 1874 4d IMPERFORATE PLATE PROOF in brown. 1874-99 4d IMPERFORATE PLATE PROOF (SG type 14) printed in the issued colour of brown printed on gummed "CC" watermarked paper. NATAL - 1897 'HALF' on 1d rose surcharge cover to UK used at P.O.A./21 of Umzumbi. 1897 (JU.5.) 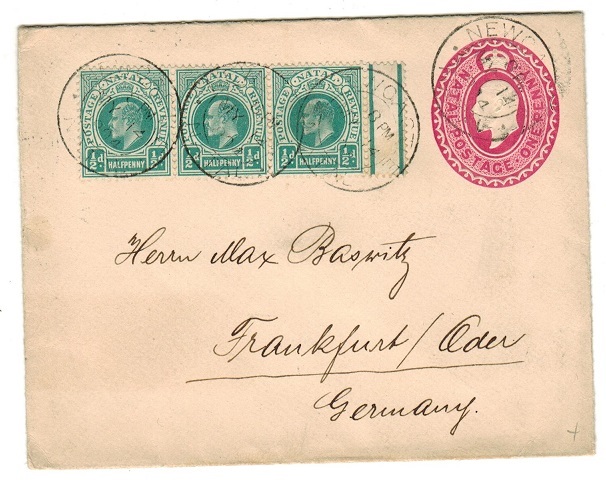 cover addressed to UK bearing five examples of the HALF on 1d rose (SG 125) cancelled by P.O.A/21 duplex's of Umzumbi. 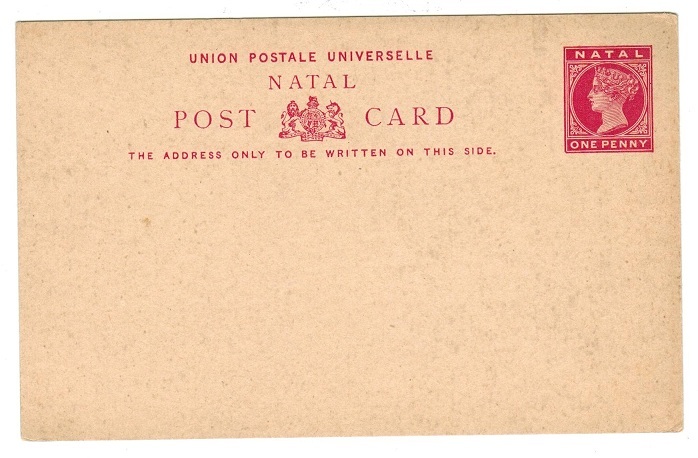 NATAL - 1897 'HALF' on 1d rose surcharge cover to UK. 1897 (JU.5.) 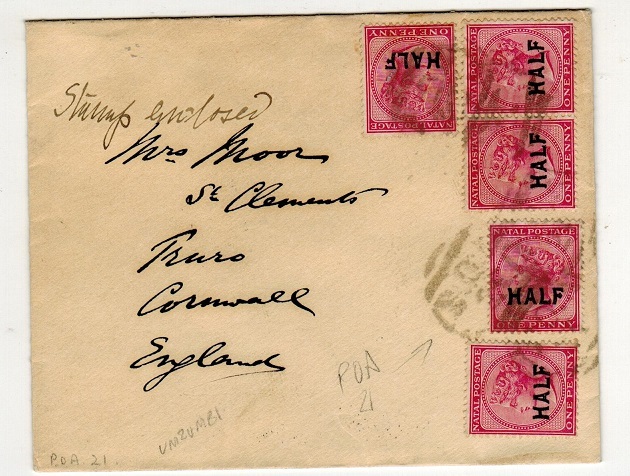 cover addressed to UK bearing five examples of the HALF on 1d rose (SG 125) cancelled by '1' duplex cancels. 1897 (JU.5.) 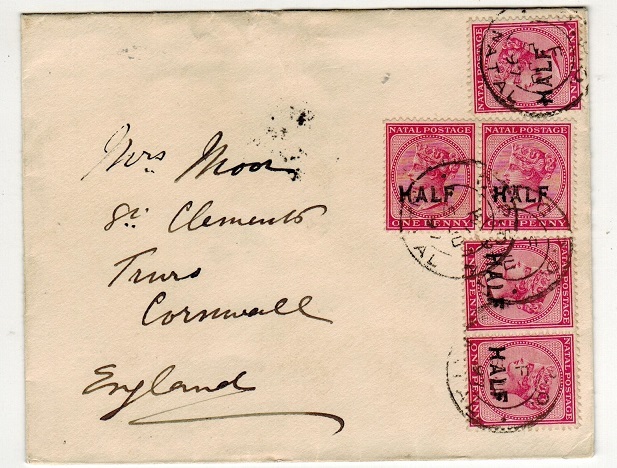 cover addressed to UK bearing five examples of the HALF on 1d rose (SG 125) cancelled by GPO/NATAL cds's with 'F' coding slug. NATAL - 1902 6d deep violet REVENUE adhesive in fine mint condition. 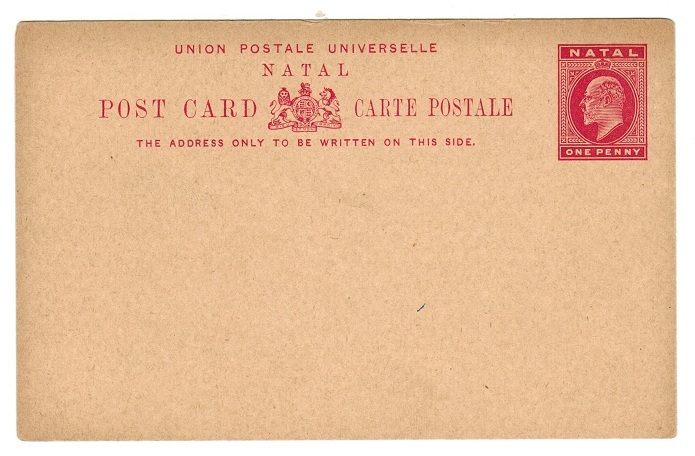 NATAL - 1902 1/2d 'Paper Rate' cover used locally from UMZINTO. 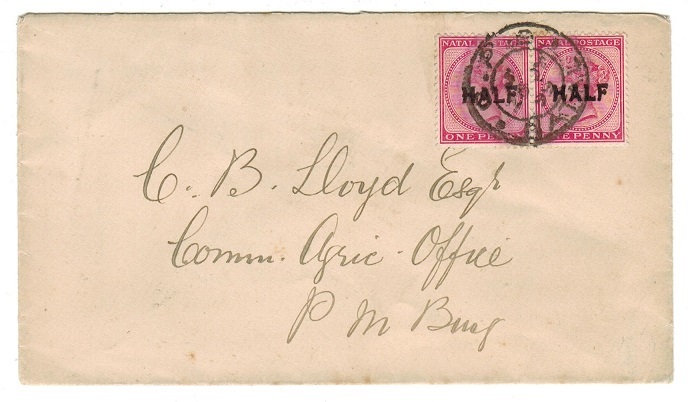 1902 (DE.24) cover addressed locally & bearing 1/2d adhesive (SG 127) tied by UNZINTO/ NATAL cds. A nice inland 1/2d rate cover. NATAL - 1905 1/2d local rate use of postcard at PAULPIETERSBERG. 1905 (DE.21.) 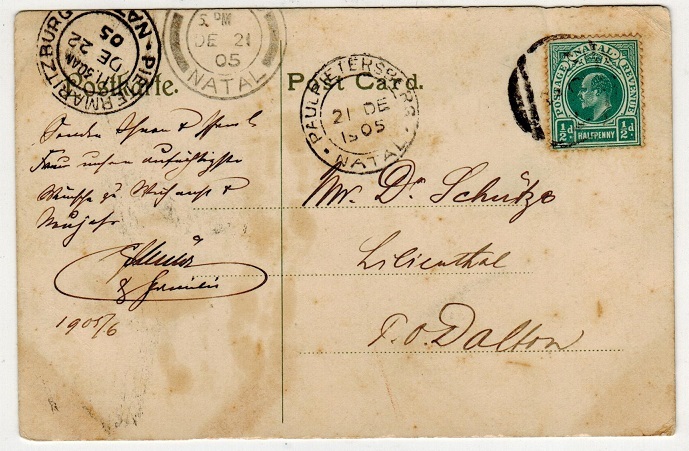 use of postcard (some light tone staining) addressed to Dalton bearing 1/2d green adhesive tied by P.O.A. agency duplex with PAULPIETERSBERG/NATAL cds alongside. NATAL - 1900 'Boer War' soldiers use of GB 1d PSC to UK written at Charlestown. 1900 (JU.20.) 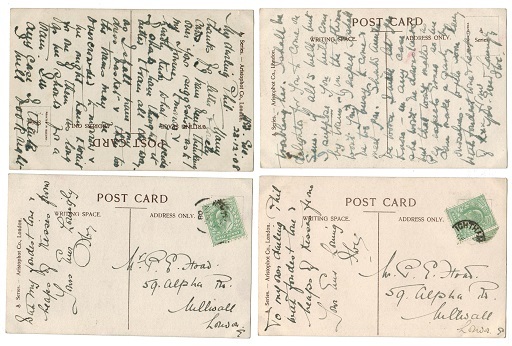 use of GB 1d postal stationery postcard addressed to UK (edge faults and creases at right edge) written from Charlestown and cancelled by FIELD POST OFFICE/BRITISH ARMY S.AFRICA cds with PIETERMARITZBURG transit. Used during the Boer war. NATAL - 1895 HALF on 1d adhesive multi franked cover to Australia. 1895 (SP.16.) 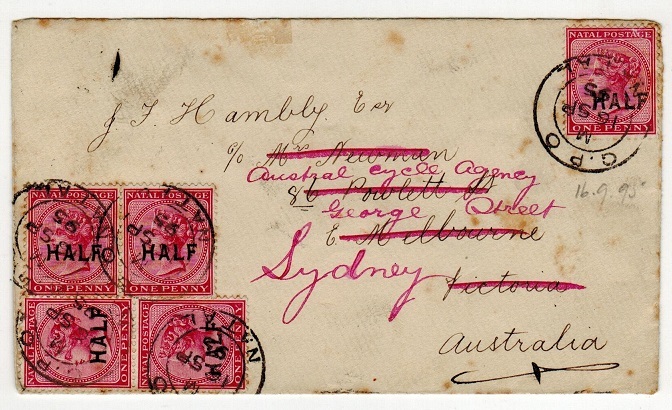 cover addressed to Australia bearing 5 examples of the 'half' surcharge on 1d rose adhesive (SG 125) tied by GPO/NATAL cds's. NATAL - 1902 1d PSE uprated to Germany from NEWCASTLE. H&G 4. 1902 1d carmine on cream laid paper postal stationery envelope (size c) addressed to Germany bearing 1/2d green adhesive strip of three tied NEWCASTLE/NATAL and dated MY.14.14. H&G 4. 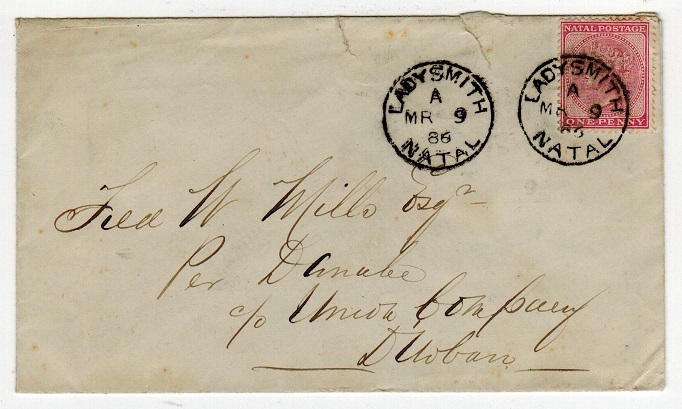 NATAL - 1876 1d rate local cover to Durban. 1876 (7.1.) 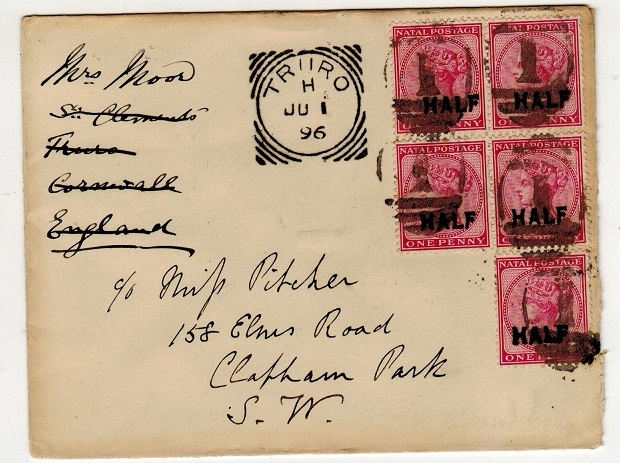 cover addressed locally to Durban (cover with pale bleach marks) bearing 1d rose adhesive overprinted POSTAGE (SG 50) tied by duplex cancel and with GPO/NATAL cancel alongside. DURBAN arrival b/s. NATAL - 1902 multi franked registered cover to USA used at DURBAN. 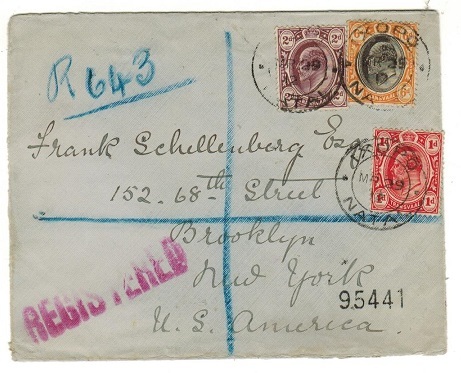 1902 (OC.18) reg'd cover to USA bearing 1d, 1 1/2d, 3d & 6d adhesives (SG 128,29,32+35) tied by REGISTERED/DURBAN NATAL cds with oval 'R' h/s at lower left. A fine four colour franking. 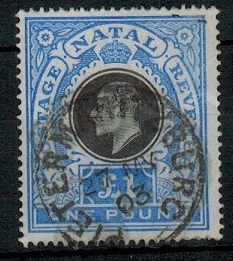 NATAL - 1902 £1 black and bright blue used. SG 142. 1902 £1 black and bright blue 'CC' watermarked issue (shortish perfs at bottom right) cancelled by near complete single ringed PIETERMARTIZBURG cds dated MY.27.03. SG 142. 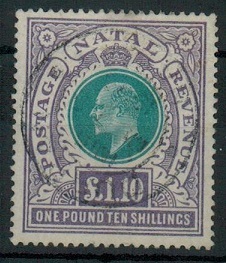 NATAL - 1902 £1.10s green and violet used. SG 143. 1902 £1.10s green and violet 'CC' watermark adhesive (slightly blunt perfs at bottom) cancelled by DURBAN/NATAL cds dated AP.11.08. SG 143. 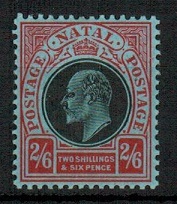 NATAL - 1908 2/6d black and red mint. SG 168. 1908 2/6d black and red on blue 'Postage-Postage' issue in very fine mint condition. SG 168. 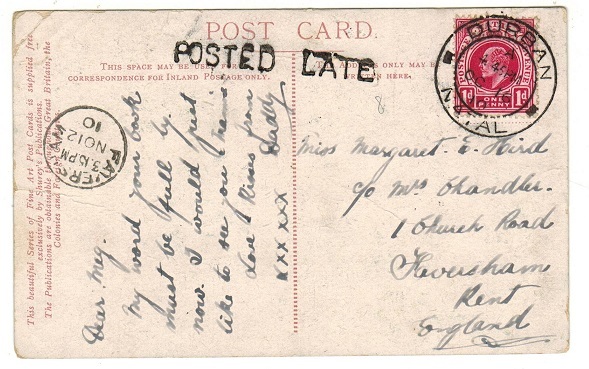 NATAL - 1901 re-use of OHMS cover to Ireland with 1d tied HIGHLANDS/NATAL. 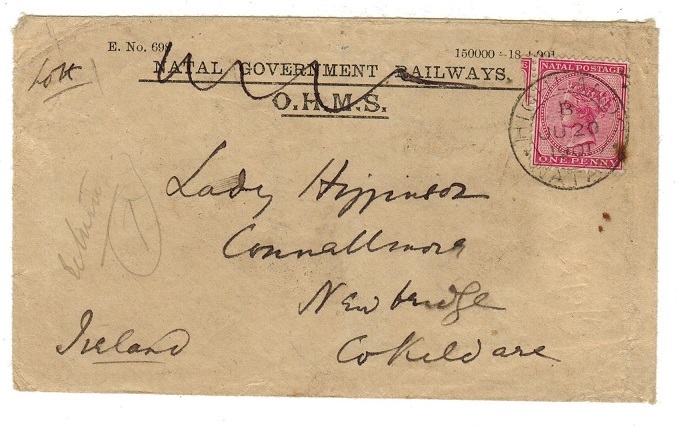 1901 (JU.20) use of 'OHMS/Natal Government Railways' envelope addressed to Ireland, deleted & with 'QV' 1d adhesive added & cancelled by HIGHLAND/NATAL cds. NATAL - 1899 HALF on 1d pair tied to local cover at GPO/NATAL. 1899 (26.JY.) 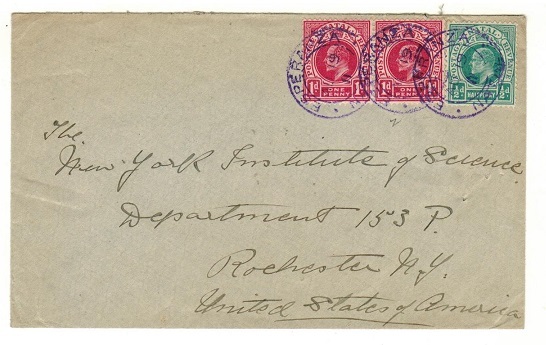 cover addressed locally bearing a fine pair of the 'Half' on 1d carmine adhesive (SG 125) tied by G.P.O./NATAL cds. NATAL - 1869 6d lilac overprinted POSTAGE in used condition. SG 29. 1869 6d lilac overprinted POSTAGE in fine used condition. SG 29. 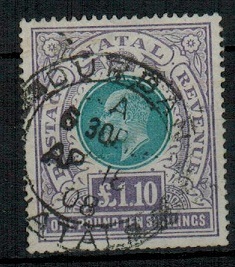 NATAL - 1902 £1.10/- green and violet adhesive cancelled DURBAN/NATAL. SG 143. 1902 £1 10/- green and violet adhesive cancelled by light central DURBAN/NATAL cds. SG 143. NATAL - 1900 'On Field Service' cover to UK used at HELPMAKAAR. 1900 (FE.1.) cover addressed to UK written in soldiers pen marked 'On Active Service' in manuscript and bearing 1d adhesive tied HELPMAKAAR and signed at lower left by the J.W.R.Montgomery the Leiutenant VC Regt. 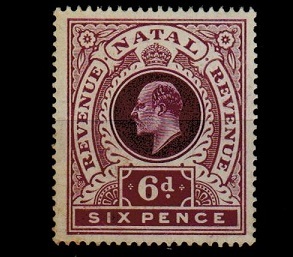 NATAL - 1876 6d violet used with INVERTED OVERPRINT. SG 83b. 1876 6d violet in fine used condition showing the major error OVERPRINT INVERTED. Complete with BPA certificate. SG 83b. NATAL - 1906 1d rate postcard to UK used at BALGOWAN. 1906 (DE.1.) use of picture postcard addressed to UK depicting 'Natives watching the race at Zambesi Regatta' bearing 1d adhesive tied by BALGOWAN/NATAL cds. NATAL - 1902 2 1/2d rate cover to France used at FAWN LEAS/NATAL. 1902 (AP.19.) 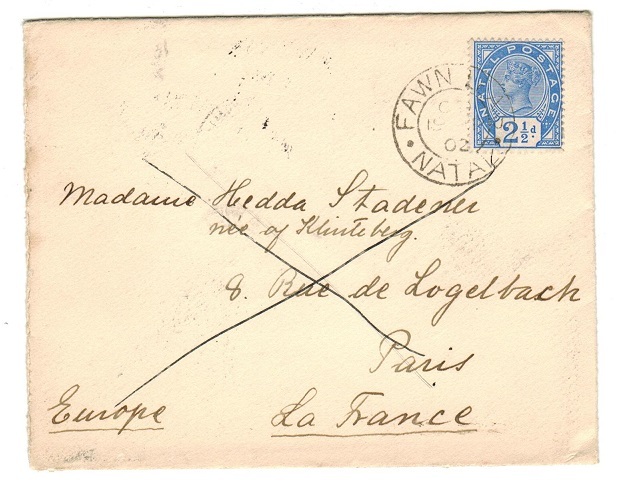 cover addressed to France bearing 2 1/2d (SG 113) tied by FAWN LEAS/NATAL cds. NATAL - 1902 cover to UK with GB 1d adhesive used at MOOI RIVER/NATAL. 1902 (AP.17.) cover addressed to UK bearing GB 'Edw VII' 1d red adhesive tied by superb MOOI RIVER/NATAL cds. NATAL - 1902 1/2d PSE used locally from WEENEN. H&G 3. 1902 1/2d green on cream postal stationery envelope (with flap) addressed locally and cancelled by WEENEN/NATAL cds dated JU.3.10. H&G 3. NATAL - 1901 'On Active Service' FPO/31 stampless cover to UK used at NEWCASTLE. 1901 (JU.2.) 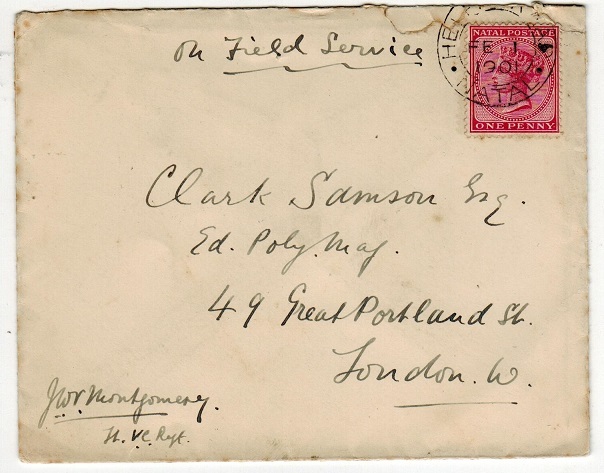 stampless cover addressed to UK in soldiers pencil and cancelled by FIELD POST OFFICE B.O/BRITISH ARMY S.AFRICA cds with '31' slug. Boer War use from tropps stationed at Newcastle. NATAL - 1915 2 1/2d 'Cape' INTER-PROVINCIAL cover usage at DURBAN. 1915 (MAR.16.) 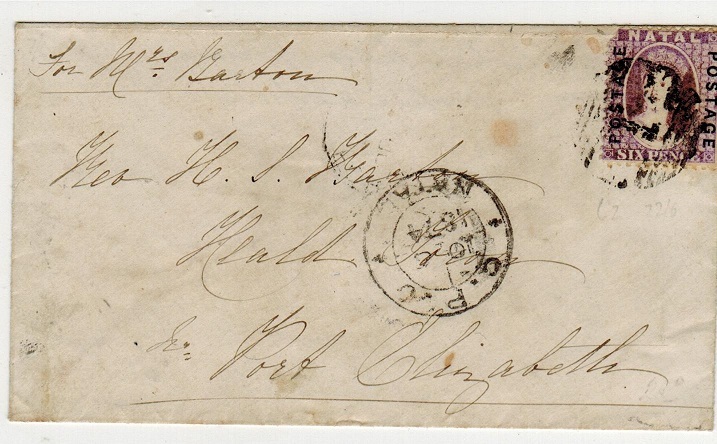 cover addressed to USA bearing Cape Of Good Hope 2 1/2d adhesive tied by DURBAN roller barred cancel. A scarce use of this Cape adhesive used in Natal. NATAL - 1902 1d rate cover to UK used at DUNDEE. 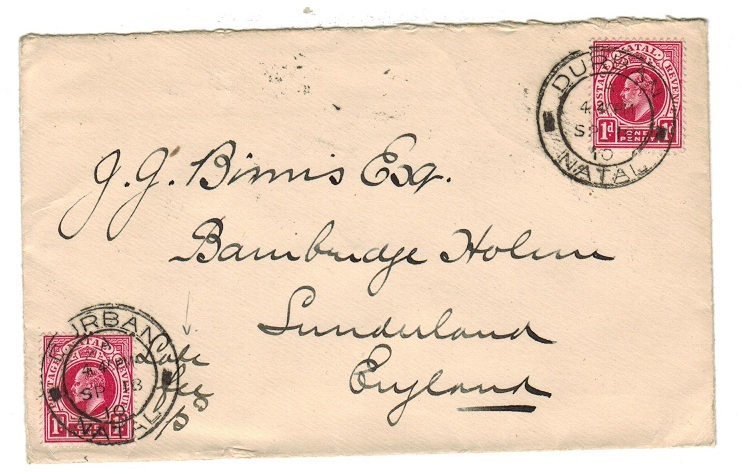 1902 (MY.3) cover to UK bearing QV 1d (SG 99) tied by d/r DUNDEE/NATAL cds. 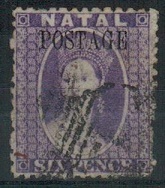 NATAL - 1875 (front only) to UK carried on the Doland Curries Line. 1875 (2.5.) 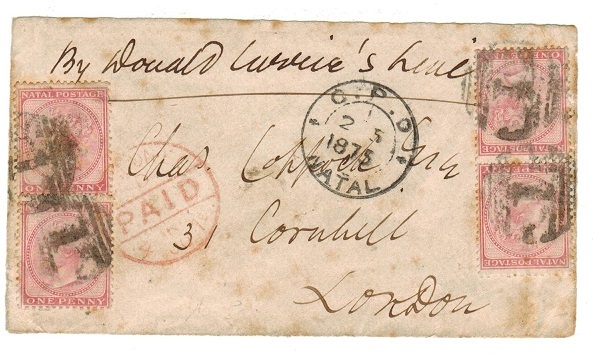 FRONT addressed to UK marked 'By Doland Curries Line' and bearing four examples of the 1d dull rose adhesive (SG 66) on 'CC' watermarked paper tied by '1' duplex and with GPO/ NATAL cds alongside. Red LONDON/PAID strike applied on arrival. (A front only). NATAL - 1886 1d rate cover to Durban used at LADYSMITH. 1886 (MR.9.) 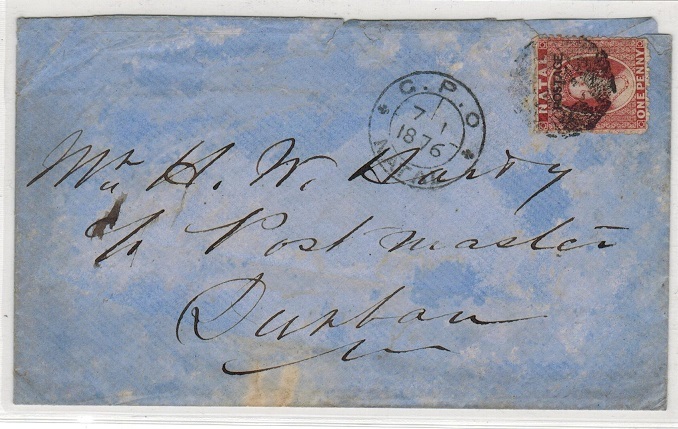 cover addressed to Durban bearing 1d adhesive tied by LADYSMITH/NATAL cds. NATAL - 1900 1d rate cover used at DUNDEE during Boer Occupation of Natal. 1900 (FE.18.) cover addressed to Johannesburg bearing Transvaal 1d tied by DUNDEE/ NATAL cds's used during the Boer Occuptaion of Natal. NATAL - 1901 OHMS censored 'Boer War' cover. 1901 (DE.7.) 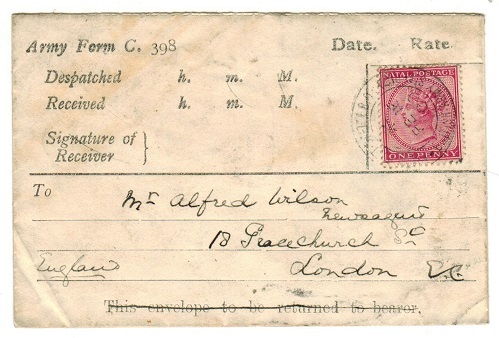 cover addressed to Durban bearing GB 'QV' 1d lilac adhesive tied by ARMY POST OFFICE cds. The cover is handstamped O.H.M.S. in violet with black on pink ON HIS MAJESTYS SERVICE/OPENED UNDER MARTIAL LAW censor label (without number) at top edge tied blue double edged triangular PASSED/PRESS/CENSOR/PRETORIA h/s. 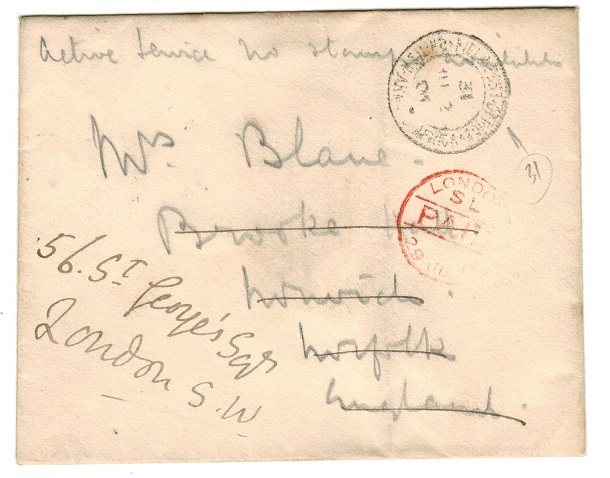 NATAL - 1899 P.K.NEWCASTLE h/s on Boer War cover to Johannesburg. 1899 (28.10.) 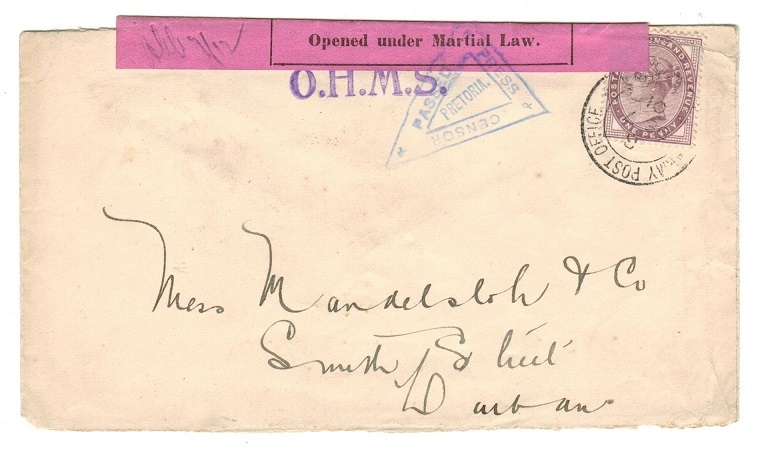 cover addressed to Johannesburg (light crease at left edge and two grease marks) bearing Transvaal 2d adhesive (SG 219) tied by violet straight lined P.K.NEWCASTLE handstamp (Hart type M.M.1.3). Johannesburg arrival b/s. Boer occupation of Natal. 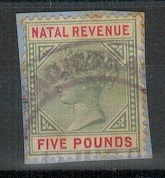 NATAL - 1886 £5 green and red REVENUE with part MAGISTRATES cancel. 1886 £5 green and red NATAL REVENUE adhesive tied to small piece by violet MAGISTRATES cancel. Barefoot 86. NATAL - 1902 1d (SG 128) overprinted NOT FOR USE. (Ex Booklet Pane). Fine mint condition. 1902-3 1d Carmine (SG128) in fine mint condition overprinted in black NOT/FOR/USE. (Ex. booklet). Elusive. 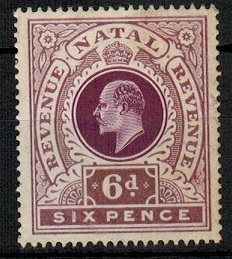 NATAL - 1902 2/6d purple in very fine mint condition. SG 138. 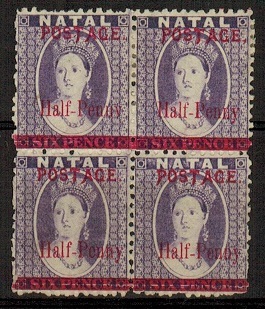 1902-03 2/6d Purple. A very fine mint example. SG138. NATAL - 1899 1d rose (SG 99) with unusual V.R.I. 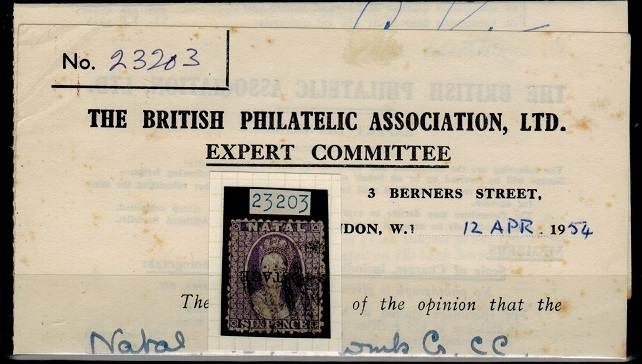 overprint and 'JHP' initials. 1899 1d rose (SG 99) adhesive (shaved perfs at bottom) handstamped diagonally 'V R I' in black ink (no stops) of an unknown font and with 'J.H.P.' initials in manuscript above. Very unusual item. 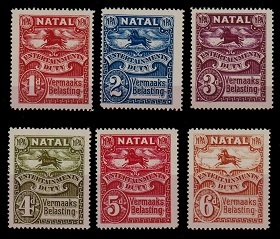 NATAL - 1895 1/2d on 6d block of 4 with REVERESED WATERMARK and differing overprint types. SG 114. 1895 1/2d on 6d Violet. 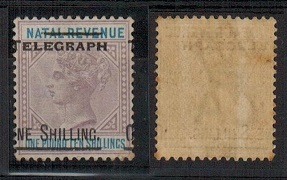 A very fine mint block of four showing the variety WATERMARK REVERSED with overprint types BA/KA/I and K. SG114. 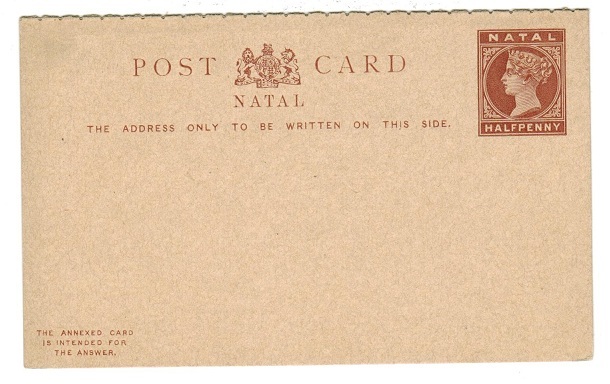 NATAL - 1881 1d brown NATAL TELEGRAPH adhesive in mint condition. 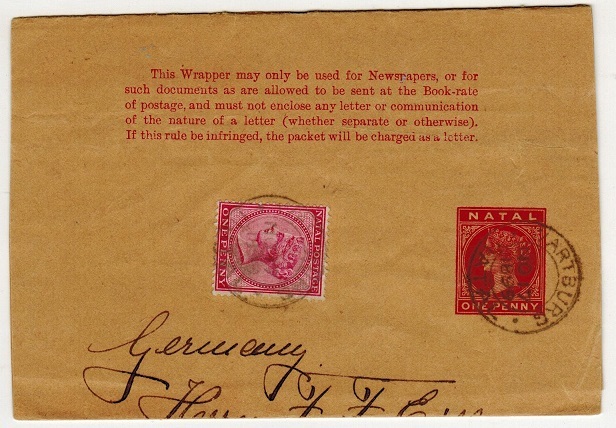 1881 1d brown NATAL TELEGRAPH adhesive in fine mint condition printed on 'CA' watermarked paper. NATAL - 1886 ONE SHILLING black on £1.10/- mint REVENUE overprinted TELEGRAPH. 1886 £1.10/- Lilac and blue REVENUE stamp in fine mint condition overprinted TELEGRAPH /ONE SHILLLING. Light overall toning. NATAL - 1925 1d to 6d NATAL ENTERTAINMENTS DUTY adhesives in unmounted mint condition. 1925 1d to 6d NATAL ENTERTAINMENTS DUTY adhesives in fine unmounted mint condition. Barefoot + Hall 7-12. 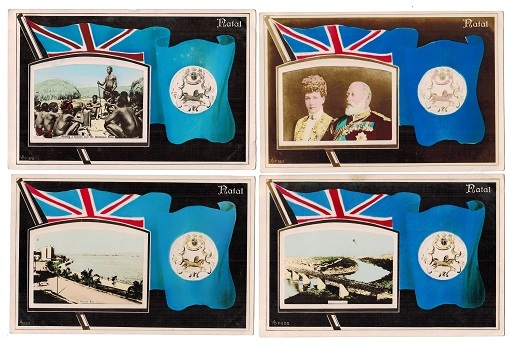 NATAL - 1902 part series of 8 NATAL FLAG postcards with differing inserts. 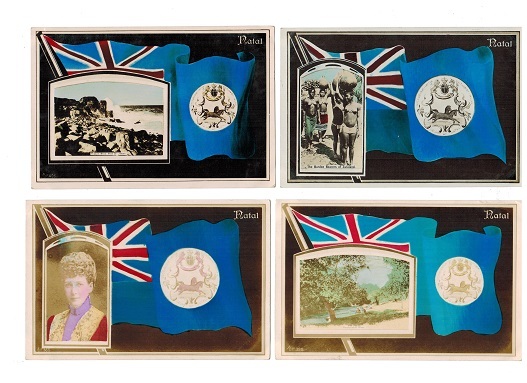 1902 part series of eight coloured picture p'cards depicting Natal flag each with different photo inserts. (Chakes rock, Burden bearers in Zululand, King George V & Queen, Queen, Amanzimtoi River, Council at Umlaloose River, Colense Bridge & Durban Bay. Five are inward from UK the other three used but unsent. A most attractive lot printed by Aristophot Company. (8 cards). 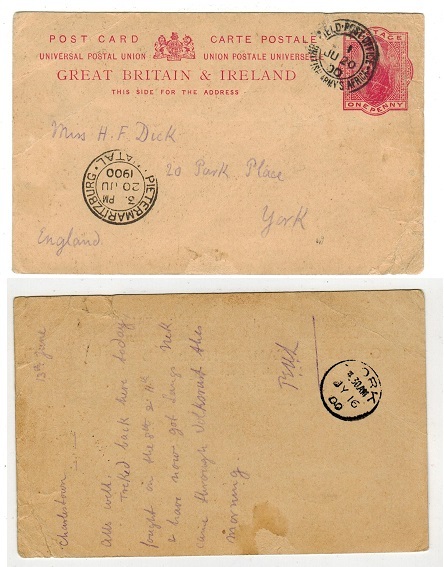 NATAL - 1910 LATE FEE cover to UK. 1910 (SP.18.) cover addressed to UK bearing 1d adhesive tied DURBAN/NATAL. Marked at lower left 'Late Fee/ 1d' in manuscript with additional 1d added and similarly cancelled. NATAL - 1902 1d PSC unused. H&G 106. 1902 1d Carmine on buff postal stationery postcard. Fine unused. H&G11. NATAL - 1902 1/2d PSC unused. H&G 10. 1902 1/2d green on cream postal stationery postcard. Fine unused. H&G10. 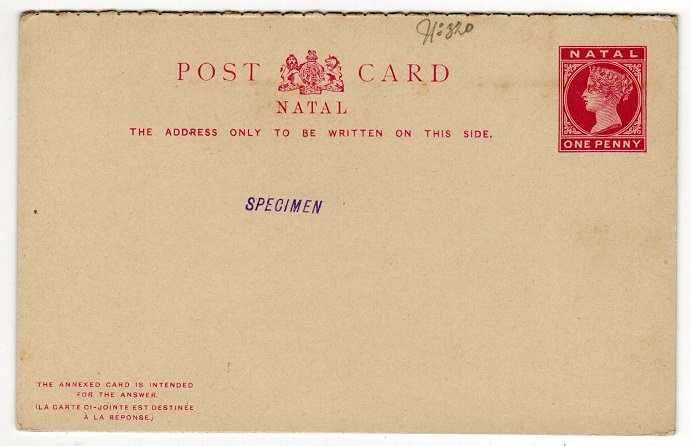 NATAL - 1894 1/2d (1d blocked out) PSC unused. H&G 9. 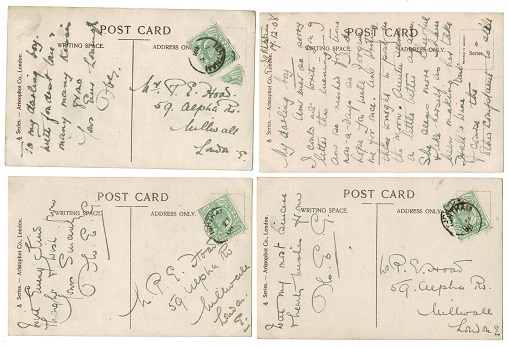 1894 1/2d Brown on buff (1d blocked out) postal stationery postcard. Fine unused. H&G9. NATAL - 1893 1d PSC unused. H&G 7. 1893 1d Carmine on buff postal stationery postcard. Fine unused. H&G7. NATAL - 1891 1/2d+1/2d PSRC unused. H&G 5a. 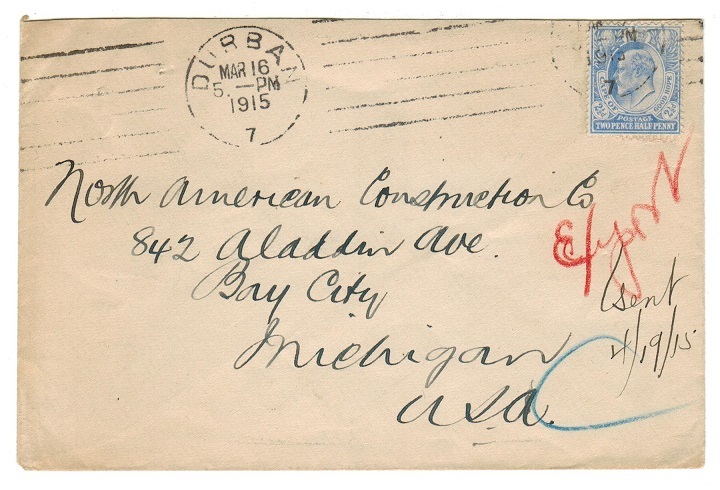 1891-93 1/2d+1/2d Brown on buff postal stationery reply type postcard. Fine unused. H&G5a. 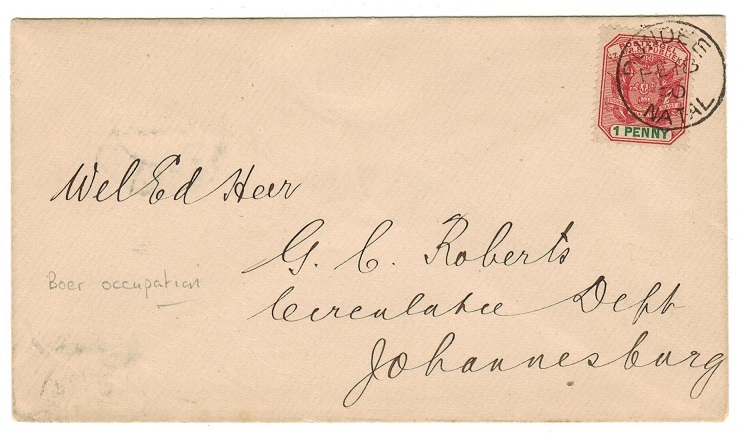 NATAL - 1899 VELDPOST ZAR/GLENCOE 'BOER WAR' cover. 1899 (Dec.18.) 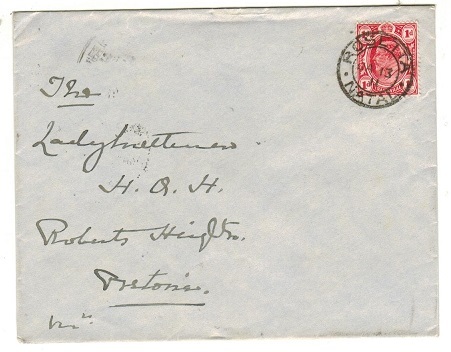 cover addressed to Johannesburg bearing Transvaal 1d adhesive tied by violet three lined VELDPOST Z.A.R./GLENCOE handstamp. Hart type MM4.4 in use for just two months during the Boers occupation of Natal. 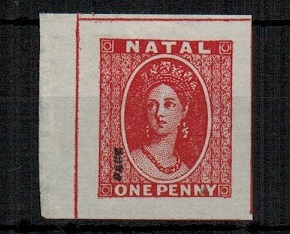 NATAL - 1865 wrapper with 1d chalon use. 1865 (OCT.28.) outer wrapper (some faults on reverse and with horizontal fold) bearing 1d brown lake 'chalon head' adhesive (SG 20) cancelled by central '2' duplex with DURBAN/NATAL crowned cds at left.